“WHEN SPEED IS NOT ENOUGH, THE CITY IS YOUR WEAPON” Day and date with its console big brothers, the iPhone version of Disney Interactive’s Death Race-like car racing game Split/Second was released onto the App Store today for $6.99. The game, which is inspired by the much larger-scale console game of the same name was developed by Disney Interactive Studios in conjunction with Black Rock Studios. 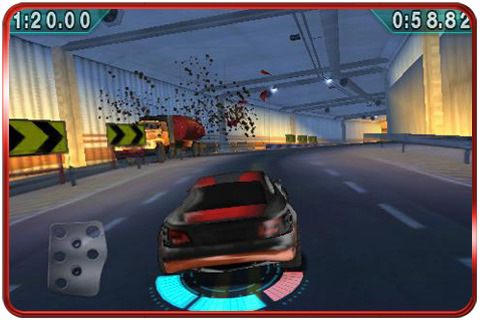 Players must race their cars through a TV city that is rigged with explosives. While trying to keep their wheels on the pavement, they must trigger Power Plays at just the right time to wreck opponents, open short cuts, and ultimately win the race. Race in 15 incredibly specialized cars, each with different attributes. That’s not all, the developer promises that new locations, vehicles and even more special features will be coming with future game updates! The console version of this game looked fantastic when I saw it earlier this year at PAXEast, so I’m excited to see how well this translates to the smaller form factor of the iPhone. Split/Second appears to not only test a player’s ability to plan strategically, but his reflexes and driving skills as well.